As soon as I found Wrate’s Editing Services on Google, I immediately had a good feeling that this was a company I could work with; they seemed friendly, approachable and had a very straightforward process. Since making contact with Danielle Wrate, I have never looked back. She basically held my hand as we journeyed together from the beginning to the end. Being new to publishing, I didn’t really know what to do; all I knew was that I’d put my thoughts into words and if I wanted other people to read them, they needed to be ironed out. My book is set in the Philippines, where I’m originally from, and what I appreciated the most is that Danielle did some research about my country and suggested some changes to my writing in order to suit the general public. The initial title of my book was Tandem, Behind the Mask, but Danielle suggested that I drop the word Tandem, as it was confusing. Instead she came up with the idea of using the Filipino words for Behind the Mask, and she even managed to find the perfect translation of the phrase! 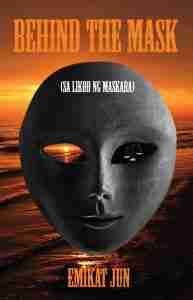 Hence we came up with Behind the Mask (Sa Likod Ng Maskara). I had a clear vision for how the book would look and Danielle and her team did an amazing job in fulfilling this – it was well beyond my expectations. My debut novel is out now and it feels fantastically surreal! For anyone who has a book waiting to be self-published, especially if you’re a first timer like me, I highly recommend Danielle Wrate and her team. I would definitely work with them again in my future writing adventures.